A literary account of the 2011 World Series of Poker Main Event in which Colson Whitehead — author of seven other books and winner of a MacArthur Fellowship (a.k.a. the “Genius Grant”) — was a participant. Following the footsteps of other chroniclers of the WSOP like Al Avarez, Anthony Holden, James McManus, and Peter Alson, Whitehead came to the World Series that summer with a wealth of knowledge about crafting narratives but lacking one bit of experience those other writers all had — he’d never played poker inside a casino before. 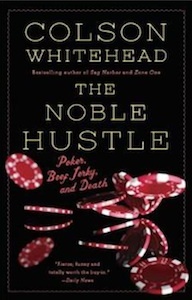 After a six-week crash course, Whitehead arrived to experience the Main Event as a novice and unveil much about the poker of culture, circa early 2010s, as well as about himself in what becomes a kind of existential search for meaning among the cards, chips, and his opponents.